Local celebrities and community leaders will demonstrate their dough-rolling skills for a chance to win the coveted Golden Rolling Pin Award at "Tortillas for Tepeyac," an annual fundraiser for Clínica Tepeyac. Clinica Tepeyac is one of Colorado’s most respected safety net clinics. The organization is a model for providing health education, prevention, and primary medical services to underserved patients in metro Denver. 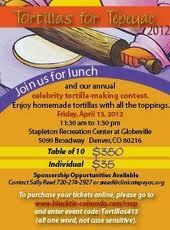 Tortillas for Tepeyac will take place from 11:30 a.m. to 1:30 p.m. on Friday, April 13 at the Stapleton Recreation Center, located at 5090 Broadway in Denver's Globeville neighborhood. Among those expected to participate in the tortilla tussle include, President of Metropolitan State College of Denver Stephen Jordan, State Representative Crisanta Duran, 9News business reporter Gregg Moss, CBS4 meteorologist Dave Aguillera, Denver City Councilwoman Judy Montero, Aurora City Councilwoman Molly Markert, Piton Foundation President/CEO Terry Minger and Senator Dan Pabon. “While we have a very impressive group of celebrity rollers this year vying for the coveted Golden Rolling Pin Award, folks will be especially riveted on the tortilla-tossing skills of rival Mayors Steve Hogan of Aurora and Michael Hancock of Denver,” said Jim Garcia, CEO and founder of Clinica Tepeyac. In addition to featuring the tortilla-making talents of local celebrities, the event will help raise awareness and funds for the local health clinic. Clínica Tepeyac works closely with other public health agencies and medical providers in the Denver metro area to ensure its patients have access to specialists and programs that assist low-income families. This year, Clínica Tepeyac is projected to provide more then 15,000 patient visits. Tickets can be purchased at blacktie-colorado.com/rsvp and enter the event code: Tortillas413. For more information, contact Sally Reed at sreed(at)clinicatepeyac(dot)org or 720-274-2927.